Included are 4 different pocket chart poems. 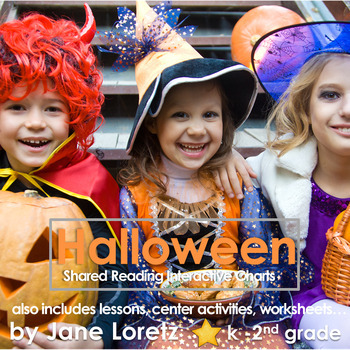 Rereading these charts will help your students with fluency and retelling stories. They are great fun to use as a lesson and then keep up for a center activity. There are so many strategies and skills that can be taught with each chart. 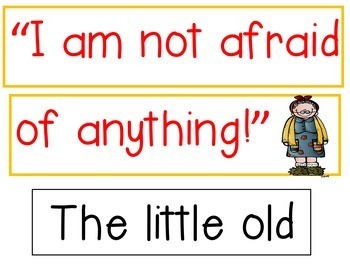 -The Little Old Lady Who Was Not Afraid Of Anything. (The repeated text from the story is your pocket chart) Students can practice retelling and sequencing this story. Afterwards have your students write about what they are afraid of…. This makes for a great class book to have in your classroom library. 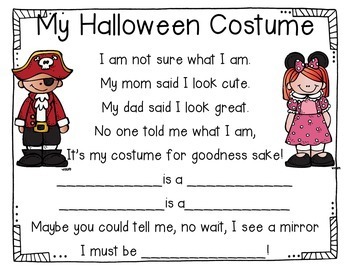 -“My Halloween Costume” is a funny poem. Reread again and again. Your students can match costume characters with the name. Also put your students names in the poem and they will love rereading this over and over again. Your students can then change the names and costumes for a fun interactive chart. -The Little Old Lady Who Swallowed a Bat-Read this book and then reread the pocket chart. Students can practice retelling this fun story. Have them color the pictures that are included and make a necklace to wear after they have practiced retelling the story. 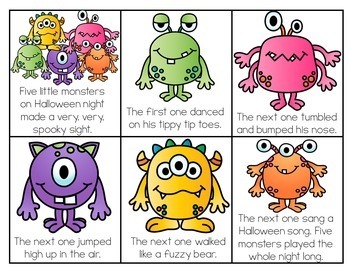 -Five Little Monsters is a great pocket chart for fluency practice. Poem included and little page to make into a booklet also included. You might also like my other interactive charts including a fall pack.